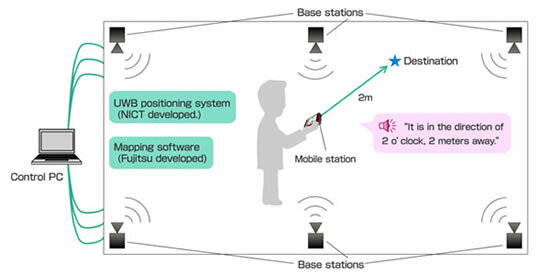 Japan’s National Institute of Information and Communications Technology (NICT) and Fujitsu today announced their joint development of an indoor support system for the blind that uses ultra-wide band (UWB) technology and a smartphone. The newly developed support system for the blind takes advantage of the ability of impulse radio UWB (IR-UWB) technology to measure distances. It is configured with several base stations positioned in an indoor area as part of the infrastructure, several mobile stations—one for the user and others for destinations—and a PC that controls the entire system. The smartphone used is a Fujitsu-manufactured docomo NEXT series ARROWS X LTE F-05D released from NTT DoCoMo, and the mapping application was developed for Android 2.3. The system is able to provide real-time positioning data, even indoors where GPS cannot be used, and provide audio instructions on the distance and direction to a destination to help guide the blind. This guidance support system for the blind reduces inconveniences facing the blind and is expected to pave the way to major R&D advances in other guidance support systems. 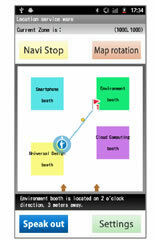 The system will be demonstrated at Wireless Technology Park 2012, held July 5-6 at Pacifico Yokohama.